The last and final show of this year’s Haute Couture Fall 2018 season in Paris succeeded all of our expectations. 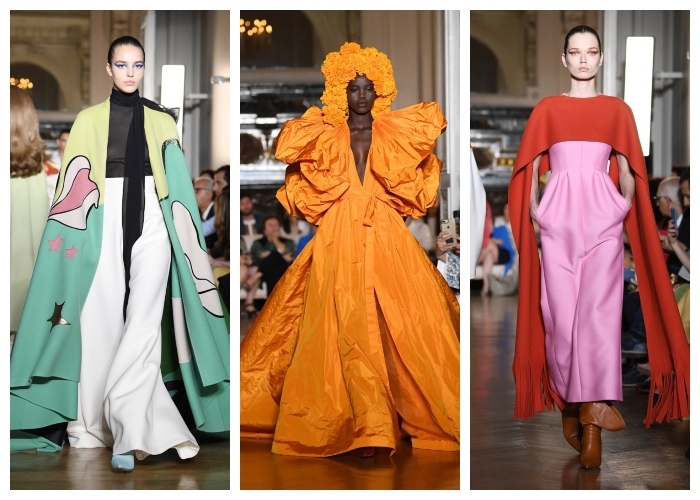 The magnificent Pierpaolo Piccioli had the honors to close the season with a whimsical show that left everyone breathless. This Italian genius doesn’t always opt for maximalism, but when he does it’s done on a completely new level. If you expected to see a Valentino couture runway filled with glamorous but classy silhouettes, get ready to see things taking a whole U-turn. The long-legged beauties of Valentino were rocking extravagant pieces that are anything but ordinary. Aside from fashion, the luxury house and its creative director paid a lot of attention to hair and makeup too. In other words, they offered the complete package! Haute couture shows are all about opulence and out of this world craftsmanship, and none of that was missing. Piccioli took his high-end guests to a magical trip back to the 60’s. According to the designer, the theme of the Haute Couture Fall 2018 show was “Renaissance meets Versailles meets the ’60s whatever’. His starting point was to escape from reality and sail away into a world of dreams where clothing can be whatever you want it to be – never enough volume, never enough extravaganza. That is actually the whole concept of couture. Unlike RTW catwalks, with show pieces that are supposed to be worn right off the runway, the deepest, most vibrant fashion dreams are becoming reality through couture creations. “With ready-to-wear, your vision of beauty relates to the times you are living in. Couture involves a deeper and more intimate perspective, to go further into your own vision of beauty.’- Pierpaolo explained. The inspiration for this breathtaking happening came from many different and contrasting places, events and ages. It all starts with his fascination with the Greek mythology. The creative director looked back to the 17th and 18th centuries and even back to Medieval Greece. James Joyce’s Molly Bloom character, Ziggy Stardust, photographs of Deborah Turbeville, and films of Pasolini are just a part of the things that had an impact on this fabulous Fall 2018 couture collection. You’ll see a lot of drama, vibrant colors and hairstyles larger than life. Guido Palau	is the	celebrity hairstylist who worked on those fabulous dos, which are as iconic as the designs themselves. Piccioli didn’t only stick to magical gowns, but also made a strong case for pants, embroidered capes, luxury jumpsuits, coats and more. It’s all done in a very surreal way that will have you wander off into a fantasy land where everything is Valentino. What an amazing ending of an even more amazing week!